It was the year 1850 and the Industrial Revolution was at its peak. Preparations were underway for the first “Great Exhibition of the Works of Industry of all Nations” to be held in London’s Crystal Palace in 1851—the brainchild of Prince Albert, Queen Victoria’s consort, to present industrial arts and crafts of Britain’s colonies to the world, and thereby promote their trade. This trend soon spread to other European countries. India, and in particular, the Bombay Presidency, as the jewel of the British Raj, was to be a key contributor to these collections. Duplicates of the products sent were made and housed in the Town Barracks in 1855 under the alias Central Museum of Natural History, Economy, Geology, Industry and Arts. Three years later, when the Crown took over direct rule of India from the East India Company, it was decided the first important public building to be built would be a museum. It would house the collection at the Barracks and be dedicated to Queen Victoria. The Queen expressed her desire to have her consort’s name added to the title, and hence Mumbai’s oldest museum, and the country’s third oldest, started off as the Victoria & Albert Museum, Bombay, in 1872, evocative of its namesake in London. It was renamed Dr. Bhau Daji Lad Museum in 1975 in honour of the man most persuasive in raising funds for its construction. Built in the Grand Renaissance Revival style, intended as a “Hall of Wonder,” the structure is a unique example of 19th Century architecture and Victorian England in India, filled with Corinthian capitals and columns, Minton tiled floors, wrought iron railings, and etched glass imported from England, and 23-carat gold gilding by Vasai artisans. By 1997, however, much of it had fallen into ruins. What one sees today is the result of intensive research and meticulous conservation by INTACH experts stemming from a tripartite agreement between Mumbai’s Municipal Corporation, Jamnalal Bajaj Foundation, and INTACH in February, 2003. The restoration project, five years in the making, was awarded the UNESCO Asia Pacific Heritage Award of Excellence for Conservation. Rightly so, as the below photographs reveal. 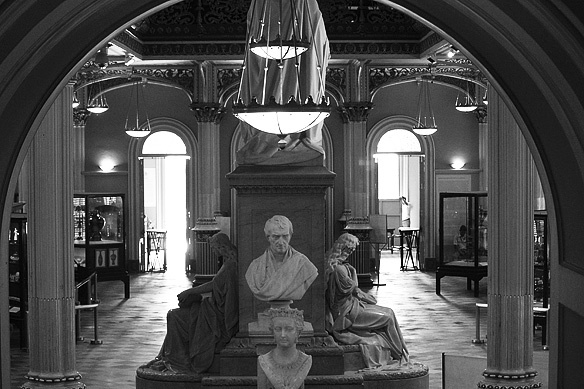 The centrepiece of the museum is a towering statue of Prince Albert, Queen Victoria’s consort, engraved with a dedication by David Sassoon (1864), and flanked by two muses. One muse holds a tablet titled “Science” and the other “Art” referring to the two curated themes of the Industrial Arts Gallery. A bust of Sassoon, who donated the tract of land on which the museum is built, stands at the foot of the statue. On the other side of the centrepiece is a bust of Queen Victoria (1819 – 1901) as a young woman, and Mountstuart Elphinstone, Governor of Bombay from 1819 to 1827, described as “one of the chief architects of the empire” by the Dictionary of National Biography. An interesting detail: The stars on the ceiling are a reference to Sassoon’s Jewish roots. The spectacular chandelier, Victorian in design and modern fibre glass in form, was added as part of the new lights and electrical fittings in the restoration exercise by INTACH from 2003 to 2008. Monogram of Victoria and Albert on the wrought iron railings: Testimony to the original name. Minton tiles imported from England cover the grand staircase and upper gallery. The ground floor is tiled in basalt. The story goes: The ship bringing the tiles to Bombay capsized on the way, and hence the difference. Another tale claims the architects of the museum just ran out of Minton tiles. Ever wondered what happened to the Kala Ghoda [Black Horse] of Mumbai’s Fort district. The equestrian statue of King Edward VII, which once enjoyed pride of place on the old Esplanade Road, is now installed in the museum lawns together with the gas lamp that once stood by the Metro Cinema and the 6th century “elephanta” from Elephanta Caves. Dr. Bhau Daji Lad [Ramakrishna Vitthal Lad], after whom the museum was renamed in 1975 was the first Indian Sheriff of Mumbai, a philanthropist, historian, physician, surgeon and secretary of the founding Museum Committee (1822 – 74). Relief sculpture of Queen Victoria and Prince Albert on the columned gateway to the museum. Inside the museum’s celadon green walls filled with 23-carat gold gilded Corinthian pillars and elegant chandeliers is its extraordinary collection of miniature clay models and dioramas of the “Mumbaikar.” Extraordinary, for there is no other equivalent to this in thematic range or numbers anywhere else in the world, to the extent that the models are now almost synonymous with the museum. The models and dioramas, made in the early 1900s, served a significant purpose. They were crafted to document the life and culture of late 19th Century up to early 20th Century Mumbai and its people in detail, not just as a source of reference for the British rulers, but also for the local populace to associate with. The first floor is dedicated to the celebration of Mumbai’s eclectic ethnicity: The Mumbaikars’ dresses, traditions, games, past-times, gods and goddesses, and occupations are recounted in vivid detail, amongst maps and ship models. Dioramas, meanwhile, highlight before and after scenarios in the British Raj’s effort to “educate” the Indians of the benefits of paved roads, welled water, and planned housing. In the ground floor, otherwise dedicated to the industrial arts, the clay models again sneak their way in. This time they demonstrate the production processes behind each art form. E.R. Fern and C.L. Burns, the museum’s first curators, who were also principals of the Sir J.J. School of Art, brought in a clay modeller from Lucknow [who was assisted by the art students], to create these colourful portrayals on show and a world in themselves. As a result, in our everyday 21st Century we get to have a dekko into the life and people of Mumbai a 100 odd years ago. And to also realise, nothing much has changed. Much of an Indian’s ethnicity is revealed by their headdress. Cognizant of this fact, the Headwear case is a magnificent record of the prevalent styles in the city of Mumbai during the late 19th and early 20th Centuries, highlighting its diversity and cosmopolitanism. The picture shows the bust and full length figure of a Koli. Kolis, farmers and fisherfolk by occupation, belong to one of the few aboriginal tribes of Dravidian origin. Their connection with Mumbai dates back to 150 AD. This 3-dimensional map, titled Heptanesia, of Mumbai’s original seven islands shows it as a group of islands separated by swamps, marshland and mangroves during 1294 – 1662. Heptanesia, the Greek word for seven islands, is the earliest documented name for the city and appears in the writings of Ptolemy. The British East India Company started training Indian soldiers who served under the British command, not only in India, but also on foreign territory as early as 1790. Soldiers from a particular area were often grouped together, commanded by officers of their own region and allowed to wear their own native headdresses. Local games: Buddhibal, also known as chess. One of my favourite pieces: Shesha Shayi Vishnu shows Vishnu reclining on shesha, the serpent, in a creative mood. And another native game: Waghbakri. The clay model shows how lacquer on brass was made in India in the late 19th – early 20th Century. In the beginning the decorative art had bold brass designs in relief. However, the European preference for detail and intricacy led to the incorporation of minute designs known as marori work in it. Rows of clay figurines display the rich ethnic variety of Mumbai, both indigenous and immigrant, through their traditional attires. Lac is the resinous incrustation formed on the bark of trees by lac insects. In lac-ware battis, or sticks of lac, are applied onto wooden articles for decoration. The model demonstrates the multi-faceted and laborious process involved in making this art product. Like its namesake in London, the museum’s original collection, now in the Industrial Arts Gallery in the ground floor, comprises objets d’art. The copies of the exhibits sent to the Paris Universal Exhibition in 1855 [though the term “copies” is a harsh one to use, for what is on display here are no less worthy in quality or appearance] cover the rich gamut of India’s heritage in decorative arts and design. But there is a twist, for the indigenous art styles display a strong European and Anglicised influence, both thematically and in form, to cater to their foreign market during that period. Where does one start? Take for instance ivory carving which centred around Mysore and Trivandrum. The ivory figurines portray European faces, motifs, and flowing hair and robes to an “imaginary” breeze in line with European aesthetics. In sandal wood carving, likewise, Christian cannons guide the depiction of Hindu deities. A wonderful example is of Parvati and Ganesh standing akin to a Virgin Mary and Jesus. And then there are the art products made from bison horn. In the allocated cabinet is a fantastical carved European lamp stand decorated with Indian embellishments: a cobra. Or the foot warmer in Bidri, an art style from Bidar in Karnataka, introduced from Persia in the 14th Century made for a wealthy patron. In Bidri, pure silver is inlaid against a black background made of zinc and copper to create delicate decorative patterns. Some art products, nonetheless, retained their authenticity in form and style all the way taking the shape of generic jars and trinket boxes. These include enamelling, lac ware from Sind, Koftagiri in which silver and gold wire are inlaid in complex and intricate patterns, and miniature painting of the Indian Ragas, rightfully called Ragamala painting. The above, I assure you, are just the tip of the industrial arts collection which brims over with each piece more exotic than the other, and once upon a time had collectively fed into Europe’s fascination for Orientalism. Foot warmer, Bidri: Bidri work is black in colour, never fades or rusts, and is inlaid with silver. The alloy used in making Bidri comprises tin and copper in a proportion of 24:1. It was introduced into India [Bidar, Karnataka] from Persia in the 14th Century. Miniature painting on ivory: Ivory, as a painting surface, was introduced by visiting British artists to India in the 18th Century. Indian artists already skilled at miniature painting immediately took to the new painting surface. The ivory was bleached in the sun to become whiter and the paints were made stickier. Detail, Gaudamalhari ragini, Ragamala painting: Ragamala paintings are sets of miniature paintings based on the Ragamala or “Garland of Ragas.” Each Raga represents a specific Indian musical mode. Cup, Silver: Malleable, ductile, and fusible. The capacity to be morphed into any desired form makes silver one of the most popular materials, historically, for creating decorative art products. Detail, Vase, Bombay pottery: The students of Sir J.J. School of Art, then known as the Bombay School of Art, created the museum’s collection of vases titled Bombay Pottery. The vessels are a hybrid of classical Greek and Roman shapes, glaze learnt by Sind artisans, scenes from the Mahabharata and Ramayana mixed with European motifs, and colouring suggestive of the Ajanta frescoes. Ram’s coronation, Ivory carving: Ivory has been used throughout India’s history for the production of both utilitarian and ornamental objects with the style and form adapting to prevailing aesthetics. In Ram’s coronation, carved during the British Raj, notice the European faces in the otherwise Indian composition and iconography. Snake, Carved stonework: The main materials used in Indian carved stonework are marble, alabaster, and soapstone. Parvati and Ganesh, Sandal wood carving: The above “European” pose was adapted from Christian concepts and was a popular subject with the sculpture students of Sir J.J. School of Art under the tutelage of British art experts. Jar, Lacquer on brass: This art style has its origin as brass imitations of Bidri artefacts. It earlier had bold designs in relief, but adopted intricate patterns to cater to Europe’s penchant for detailed ornamentation. Craftsmen in Jaipur later introduced a rich variety of colours in lacquer to apply on the brass ware, leading to its current known form. Address: Veer Mata Jijabai Bhosale Udyan [Rani Baug], 91/A, Dr. Babasaheb Ambedkar Road, Byculla East, Mumbai. Timings for tours: Every Saturday and Sunday: 11:30 am – English; 12:30 pm – Hindi/ Marathi. Museum timings: Thursday to Tuesday, 10:00 am to 6:00 pm; Last ticket sold at 5:30 pm. Closed on Wednesdays and certain public holidays. Ticket: INR 10 for Indians; INR 100 for foreigners. Photography is allowed inside [without flash, and non-commercial]. This entry was posted in Art and Me, Bombay aka Mumbai and tagged British Raj, Clay Models, Dr Bhau Daji Lad Museum, Indian Arts and Crafts, Indian Decorative Arts, INTACH, Sir JJ School of Art, Things to see in Mumbai, UNESCO Award for Conservation, Victoria & Albert Museum Bombay, Victorian Bombay by Rama Arya. Bookmark the permalink. Thank you for the beautiful and thorough write-up. India is on my travel list but now this museum will be a must. Read your blog. Chin up, queenexkuytie. 🙂 Everything will fall into place, sooner or later, hopefully sooner. Enjoy the journey meanwhile–the highs and the lows. Take care. Keep writing consistently and meaningful original content. 🙂 Everything else, thereafter, falls into place. Obrigado pelo presente. A Índia será meu roteiro. Thanks for this wonderful article! I love the idea of getting lost in this museum! Yes, it is a lovely thought indeed! 🙂 Thank you for commenting. Appreciated. All the valid reasons to love this museum. And I did 🙂 Here are some of my impressions, if you’re curious http://www.indiapalette.com/my-cultural-shock-dr-bhau-daji-lad-mumbai-city-museum/ . I didn’t know about the public tours, by the way. Would be great to attend. One of my favourite places to visit in Mumbai city and enjoy going for all their art exhibitions, film shows and lectures regularly. I am in Mumbai at the end of January. Your blog has changed my mind about going to the museum. I shall try to get there. These are lovely pictures of a lovely place. A great article too! I wonder, have you ever been to the Great Pyramids in Egypt? That would be one heck of a trip. Seeing some of the ancient stonework there is on my bucket list, that’s for sure. Thanks much, mrarik! Yes, I have been to Egypt. 🙂 I travelled solo from Abu Simbel to Alexandria way back in 1999. It was an incredibly unique experience to say the least and rightfully deserves to be on every traveller’s bucket list. If you would like to read my Egypt posts, the link is https://ramaarya.wordpress.com/category/exploring-our-world/egypt/.